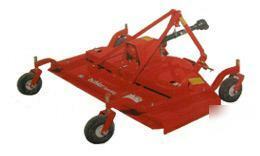 Brand New Buhler/Farm King Model Y650R, 72" (7'), 3 Point Mounted, Rear Discharge, Rotary Finishing Mower. * Rated for 20 to 40 HP Tractors. * 72" Mowing Deck (of course). * Heavy Duty 540 RPM PTO Shaft. * (4) Pneumatic Tires with Sealant to prevent flats. * Mower is Complete and Ready to Use! * Availability can vary from 2 days to 2 weeks. * For more info, call us at .